We used to love Chad Vader. The first season was pure awesome – as our Fav Sith’s (brother?) made his way through life as the night shift manager at Empire Food Market. second season was also fun. third season mostly sucked – and that was almost two years ago. since then – no chad vader. Guess What? Chad is coming back. After a two year hiatus Blame Society Films is bringing him back starting on June 12th for a five episode run. We couldn’t be more excited. And just for old times sake – here’s a link from our fav Chad Vader episode – Episode 6 from all the way back in 2007. After that first issue we *almost* thought that Boba rly did get toasted. He is after a clone, and hey lots of his brothers are around. 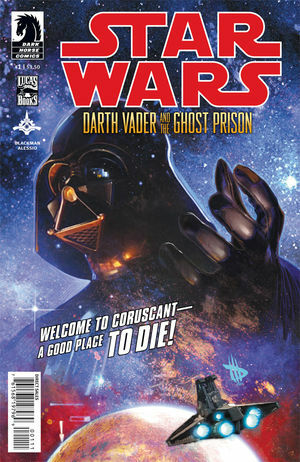 Now in this issue we get the real story – what happened and how his nice Mando’a helmet had a blaster bolt through it. No surprise that Boba is going to use his half-brother to help him out, but what was a great surprise was seeing Sintas Vel. that’s right – Sintas Vel, the woman that Boba Fett (in the books) has a child with. We can’t recall seeing sintas so beautifully drawn – errr painted as she has been in this issue. 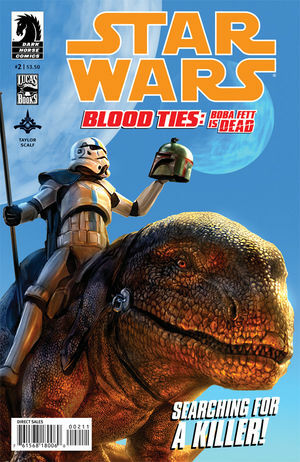 Now the real hunt is one as we’ll find out how Boba can track down his own killers. No we don’t really care why they wanted to kill Boba, he is after all a bounty hunter so no doubt he has a lot of marks on his head. The relationship between Boba and Connor Freeman (his half-brother) is interesting though. As it should be right? That’s what — Blood Ties – is all about. We all know Darth Vader to be a menace. But what we get in this new series is something a big …different. This first issue is pure genius. We get our young Imperial Officer just graduating as the core character, we see the Empire through his eyes . And we see Vader through his eyes — and it’s an awesome sight. In the midst of Chaos it is Vader that restores order. In the midst of rebellion it is vader that stands up to put his lightsaber through those that would oppose him. This is the Dark Lord of the Sith as he should be – as an instrument of the Empire. 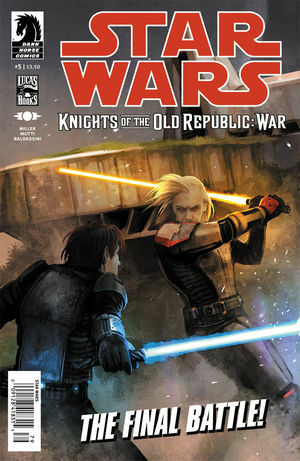 The whole Knights of the Old Republic: War series was interesting for a few reasons. It was neat to see Jedi aligned with the Mandalorians and it was great to see Zayne Carrick not being the ‘bad guy’. We got to see a different side of Zayne in this series — Zayne the hero and it was a side that we sure enjoyed. Isn’t that what he was just trying to do in the very first issue of this series? go home see his family and his girlfriend? We all know that Star Wars is huge – but did you know that Star Wars has generated at least $33 Billion in revenues over the last 35 years?! Yeah we were a little shocked too.